When you’re trying to think of ways to improve your sleeping experience, you might yourself looking into memory foam pillows. There are many different types of memory foam pillows, but contour pillows can help ensure that your head is supported. They can even help reduce snoring and pain when you sleep. Now, this may sound amazing, but you’re not sure how to get the best possible pillow. Getting the best memory foam contour pillow is about knowing what you really need from the pillow and we’ll help you understand what is out there for you to try. Who Needs a Memory Foam Pillow? Not everyone needs a memory foam pillow, but there are many good reasons to get a memory foam pillow instead of a typical pillow. The pillows are made to last for quite a while and the contour style can actually help with many problems that people have when they sleep. If you or a partner snore a lot when you are in bed, then getting a contour pillow can actually position you in a way that prevents the snoring. However, there are other benefits. If you find yourself having neck pain after you sleep, then this pillow will really be able to help you. However, this kind of pillow will probably work best with those that sleep on their backs. 19" x 15" x 2.5/3.5"
19" x 15" x 3.75/5"
1. How Soft Should Your Pillow Be? When you use a memory foam contour pillow, you will want to make sure that you are laying the right way to allow it to support you. Laying on your side will not help your body get the most out of the pillow. By laying on your back, you will allow the pillow to help support your neck. The way that it also helps open your throat and mouth to help avoid the issue of snoring. It can help with sleep apnea issues as well. The best part of getting a memory foam pillow is that it will work with you and not against you. While it works best when you’re on your back, the foam will adjust to the contour of your body, so you can make it work for you if you are on your side. Getting the best memory foam contour pillow is about knowing what you really need from the pillow. While you are probably looking at this pillow because you want some relief from neck pain, there are some specifics that you will need to decide on based on how you sleep and how you like to sleep at night. This is going to be one of the biggest concerns that you have when you’re looking at pillows. This will depend on what your wants and needs. There are high-density and low-density foam types. The difference between the two is the firmness of the pillow. The higher density pillows are going to be more supportive, but that might not be great for everyone. The lower density ones are softer and might be better for those people that only need a little bit of support and still want a pillow that will be nice and soft during the night. In the end, you will have to figure out that there’s a style that works better for you. If you were told that getting a pillow like this can help with snoring and other issues by a doctor, then you might have also gotten a suggestion for how firm or soft the pillow should be to make sure that you’re not causing any more problems for your body. Many memory foam pillows are going to be easy to take care of. While you might not consider throwing a more traditional pillow into the washing machine, this might be an option for some of the memory foam pillows that you’re getting. This option can make sure that you’re getting rid of the oil, dead skin, and other debris that gathers on the pillow. While you can use a pillow cover to try and make sure that you’re keeping as much of that off of the pillow as possible, but there’s always going to be a little bit of stuff that gets on the pillow. Being able to keep the pillow clean means that you will be able to keep your skin and hair cleaner during the night. This might definitely be worth it to people that need to keep their hair as clean as possible. However, keep in mind that not every pillow can be washed. And the directions for how often and even just how to wash it will be different from pillow to pillow. Make sure that you’re reading the directions and only washing it if you can and in the way that will make sure that the pillow lasts as long as possible. While you might be tempted to go for the most expensive pillow, you shouldn’t necessarily go there first. Getting a good pillow doesn’t mean that your wallet needs to be emptied. There are many cheaper options out there that can provide the right amount of support for many different people. You’ll want to investigate the options thoroughly to make sure that you’re getting a good deal, but also making sure that the pillow will really serve the purpose that you need. If you just want to try one to see if it helps you get a better night of sleep, then you will probably want to try one of the cheaper options. However, if your doctor or chiropractor suggested using one of these kinds of pillows, then you might want to pay a little bit more for one that fits more of the qualities that they wanted. They might even have a suggestion of which one you should get. If that option is too expensive, then there are some other ones that will have many of the same features while still being quite a bit cheaper. 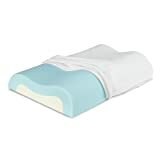 Having a memory foam contour pillow can offer a lot of benefits to the individual that needs to use it. The pillow also works well because it can help alleviate problems that are otherwise tackled by medicines. By using a contour pillow instead of medicine, you will avoid the unsavoury side effects that happen when you’re taking meds. The pillows can offer a lot of the same support that the meds can. Depending upon the design of the pillow, you’ll find that they’ll work better for a certain sleeping style. However, the fact that you’re using a memory foam pillow will mean that you’re going to have a more comfortable night of sleep. The way that a contour pillow will help your spine stay aligned can really improve your life a lot. Using one doesn’t require much change in your life, so this pillow might be a great way to improve your life. Finding a good pillow may be as simple as knowing the brands that are available to you. While there are some brands that are better known than others just by the other things that they have built, we want to make sure you know about some of the top brands that are out there. Aeris may make a wide range of products that they sell online, but they do have a focus on pillows for all sorts of situations. Their pillows are all made to make sure that you’re getting the relief you need, regardless of where you are. CR is another online company that makes a couple different products, but many of their products are focused on reasonably priced home items. Pillows are a big part of your home, so you should definitely be paying attention to them. Sleep Innovations makes tons of products for your bedtime. You’ll find air mattresses, toppers as well as pillows. This is one company that is definitely focused on your sleep and making a good experience. Nakital makes a wide range of products, but they focus on making a number of pillow products. They even make pillows that are specific for pregnant women, so you know they’re trying to improve the quality of your sleep life. Tampor is another online company that is a little bit newer. They produce products that are just around the sleep experience. You won’t be disappointed by the price or the comfort of the products that they make. Bedsure makes covers, duvets, quilts and more. They even make products for babies as well. This brand is focused on the sleep experience for the whole family, so you’ll know that their products will work for anyone in your house. ESEOE makes tons of products that are used around your home. There are tons that they make that are aimed at your life just as you wake up. It makes sense that they would also make a contour pillow that will help your morning be wonderful. ComfyLife makes products for your home as well. Their products are for all ages, but they even make products for young children. This means that you’ll find durable products that will stand up to what your family goes through every day. Okwu Comfort products are centered around making everyday experiences that more comfortable. They make pillows for your bed, for travel, and even for your chair. This means that they’re really focused on your experience all day long. Sensorpedic makes pillows, mattress toppers, and mattresses. They’re an online company that focuses mostly on memory foam products, so you know that they’re going to be delivering a great product for your sleep experience. Tempur Pedic is one of the brands that you will know quite a bit about. They are most famous for their memory foam mattresses. Because they know what to do for a good mattress, it makes sense that they also know how to make a good memory foam pillow. Relax the Back is a company that focuses specifically on the health of the back. Getting a product from them is probably going to help you with any back problems that you are suffering from. When you’re shopping for both mattresses and pillows, you’re likely going to be looking for something that works with your lifestyle. This may mean looking for something that is hypoallergenic. Hypoallergenic bedding makes sure that you wake up without a stuffy nose. Getting hypoallergenic pillows and mattresses can be extremely important for some people. Mold and mites can get into the bedding and can seriously impact the sleep of some people. Usually, people will find out if they need hypoallergenic bedding fairly early on when they’re having problems sleeping as a kid. Luckily, memory foam is also extremely comfortable which means that getting one of these won’t just be comfortable for everyone, but it will actually be something that everyone will want to use. Other hypoallergenic options for pillows are materials that don’t easily grow mold or allow dust mites to live, but many of those materials might not feel that great when compared to the comfort that you will be able to get from a contour pillow made of memory foam. Having a water resistant pillow is going to make it easy to sleep soundly and not worry about your pillow absorbing anything. You will probably be worried about drool or water dripping onto your pillow more than anything else. If your memory foam pillow isn’t already fairly water resistant, then you may want to invest in getting a cover for your memory foam pillow. While they are going to last for quite a while, making sure that they’re not absorbing liquids can help ensure that the pillow stays in the best shape possible. The water that gets in may facilitate the growth of mold or mildew that will then activate allergies and make your sleeping experience less than pleasant. Many memory foam pillows will have outer layers that are water resistant, so this might not be the biggest of concerns. However, if you’re worried about kids spilling water on the pillow or if your spouse drools quite regularly, then getting an extra cover to help prevent as much liquid as possible from getting into the pillow is a great way to make sure that the pillow will last for quite a long time. This pillow is made by Sleep Innovations that makes tons of products that are meant to improve your sleep. This is just another one of those products. This pillow has a cover that is just as hypoallergenic as the actual pillow. This means that you won’t have to look for a pillow that will work with you as well. This pillow has both the higher end and the lower end. You can sleep on either side of it. You may find that one will work better for solving the problems that you are experiencing. The pillow returns back to its shape fairly well and stands up to the other more expensive brands that are out there. 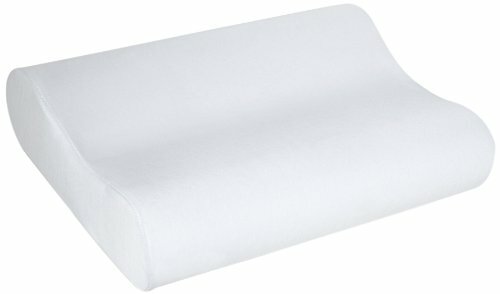 People that get pillows like this one often complain that it is uncomfortable after the first day. That’s actually fairly common for pillows that are like this. You’ll want to give it at least a couple of days before you form an opinion about the pillow. Those couple of days will really allow your body to get used to the pillow. There is a blue layer of the pillow that you will see if you take it out of the cover. This layer is the part of the pillow that will keep you feeling comfortable during the hottest months. It works well for many people, but some find that it isn’t quite enough. This pillow has a nice feature right away and that is the bamboo cover that is on the pillow. This pillow cover will be nice for people who have allergies and it comes off so that you can wash the cover whenever you need to. This pillow has a thin end and an end that is a little bit thicker. You will be able to use either end when you’re sleeping. The pillow specifically tries to avoid using products that will hurt you like mercury and lead in its production. 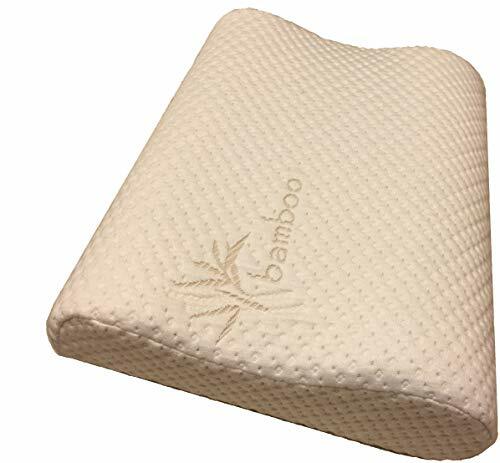 This and the bamboo pillow cover make this a very eco-friendly option when you’re looking for a pillow that will make you feel quite a bit more comfortable when you’re sleeping at night. This eco-friendly option is a little bit more expensive than other pillows that we have talked about, but the higher price means that you’re getting better quality materials that will last quite a bit longer than with other pillows. For some people, this pillow may not be exactly right or take a little bit of time to get used to as it is a different style of a pillow than the typical one you see on a bed. Make sure that you’re giving yourself time to get used to this pillow as it may be slightly uncomfortable the first few times that you use it. 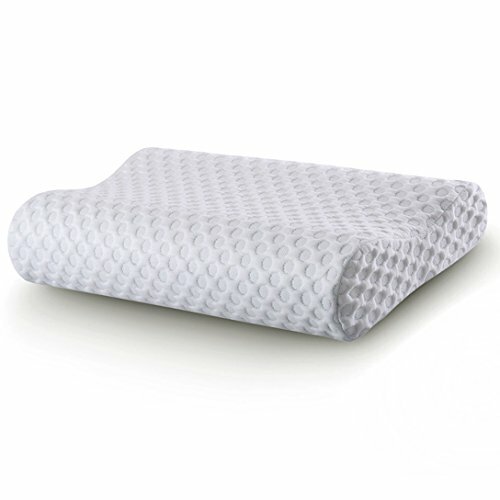 This memory foam pillow is made to work well with your bedroom. The design of the actual form is made to make sure that the pillow is ventilated, regardless of how you are sleeping on it. The foam that makes up this pillow is going to resist the growth of things like mold or mites. This means that you won’t be worried about this pillow if you need something that is hypoallergenic. The design of this pillow is rather simple. This means that it will work well with several different sleeping styles. The pillow also comes with a cover that you will be able to take off and wash whenever you want. The pillow comes in a really small package, which means that it’s easier to get into your home and not worry about. It will expand to its full size after you have opened up the package. Once it is at its full size, you’ll find that this pillow is a little bit firmer kind of foam than some others. For many, this is a great thing. However, you might want to be careful when using it. It is possible that it can make your neck hurt a little bit. Getting the best memory foam contour pillow is a great way to improve your sleep experience. This pillow can help make sure that you’re going to be as comfortable as possible when you’re sleeping in your bed. This can also make sure that you’re not experiencing any other inconveniences when you’re sleeping at night. After all, you want to start your day feeling your absolute best.